Whilst this isn’t strictly a Savoyard dish, The Tarte Tatin is definitely French and popular throughout France. There are many apples grown in the Haute Savoie and we live next door to an apple and pear farm. Most villages in the Haute Savoie have an annual apple and cider festival in the early autumn and Tarte Tatin amongst other apple flavoured confections and drinks are on offer. The origin of the Tarte Tatin is still in question. The most popular story is that it was created by accident around 1880 in the small town of Lamotte-Beuvron about 100 miles South of Paris. Stéphanie Tatin, who ran the family hostel with her sister Caroline, once accidentally dropped an apple tart while rushing around the kitchen. With hungry patrons calling, she promptly picked it up and rearranged it as best as she could, which happened to be upside down and stuck it in the oven. Once baked, she flipped it back up on a dish and discovered to her surprise the rich caramelized texture that is the Tartes hallmark. For further information about the history of the Tarte Tatin, I found this fascinating website: Friends of The Tarte Tatin. It seems the Tarte Tatin has a dedicated following! There are many Tarte Tatin recipes and numerous variations. If I need a quick dessert, I make a modern day version and I’ve seen variations of this recipe from several sources. Many different fruits like pears, bananas, pineapple, peaches can be used. I’ve seen several savoury versions too that look rather yummy. Roll the pastry sheet into a 101/2-inch square on a floured work surface with a floured rolling pin. Brush off excess flour and cut out a 10-inch round with a sharp knife, using a plate as a guide. Transfer round to a baking sheet and chill. Spread butter thickly on bottom and side of the pan and pour sugar evenly over bottom. I often sprinkle cinnamon too. Arrange as many apples as will fit vertically on sugar, packing them tightly in concentric circles. Apples will stick up above the rim of skillet. Put the pan in middle of the oven over a piece of foil to catch any drips. Bake for 15 minutes (apples will settle slightly), then remove from the oven and lay pastry round over apples. – If you prefer your apples less caramelized skip this stage – as the photo above shows. Bake tart until pastry is browned, 20 to 25 minutes. Transfer pan to a rack and cool at least 10 minutes. Just before serving, invert a plate with a lip over the pan and invert tart onto platter. Replace any apples that stick to skillet. (Don’t worry if there are black spots; they won’t affect the flavour of the tart.) Brush any excess caramel from pan over apples. Serve immediately. The tart can cool in the pan for around 30 minutes. It can also stand, uncovered, up to 5 hours, then be heated over moderately low heat 1 to 2 minutes to loosen the caramel. Shake pan gently to loosen tart before inverting. Tarte Tatin ready to be turned upside down! I also made a version of the Tarte Tatin using Mirabelle plums, to which I added almonds in the syrup. 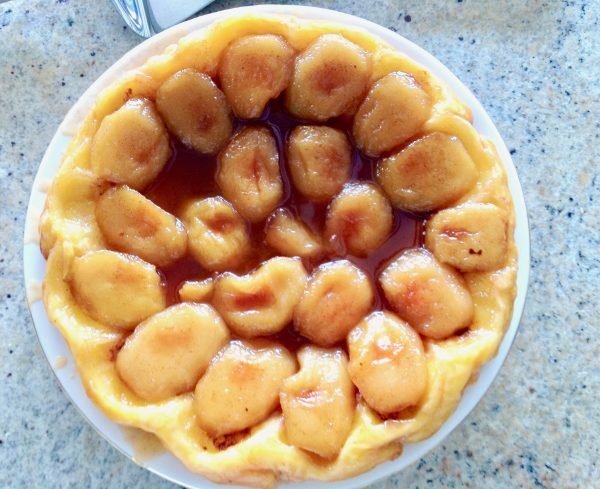 Pin this recipe for Tarte Tatin to make later!